Sometimes, quite out of the blue you get to hear about extraordinary feats by lesser-known cricketers – performances which hardly challenge the record-books, yet are so heroic that it makes any admirer of the game feel pleased. Such moments remind you about cricket’s greatness and the will power of a cricketer. Services’ astonishing upset victory in the Ranji Trophy quarterfinal four days back was one such example of cricket’s ability to be a great leveller, and the team’s captain Soumik Chatterjee’s valiant innings was a heart-warming display of a cricketer’s will power. The gutsy group of members of the Indian defence services dished out a worthy performance to book a place in the semi-finals for the first time, beating fancied Uttar Pradesh, the top team in the league phase, by 5 wickets at Indore. Chatterjee showed exactly the attitude of the Services, when he hobbled out to bat in a tense chase, eventually leading his team to victory. Services topped Group C, the pool with lower-tier teams, to book a place in the quarterfinals against an hitherto unbeaten Uttar Pradesh. Moreover, U.P had collected 33 points in the league phase, more than any team across all three groups. But on the first day of the game itself, Services proved that there were no pushovers – medium pacer Shadab Nazar, an Air Force corporal, took 5/51 to condemn Uttar Pradesh to a lowly total of 134, which could have been far lesser if not for Imtiaz Ahmed’s counterattacking 53* from No.9. Then it was young Rajat Paliwal’s turn to stand up, as he made a breathtaking 112 coming in at a tricky 79/4. The would-be sergeant faced just 133 balls, and hit 16 fours and 2 sixes. With a 129 run lead in place, the game was Services’ to lose. In the second innings, yet another unknown fighter sprang up for the Services, this time being the medium-pacer Suraj Yadav. Services went for the kill as Yadav mopped off the top-order to have U.P at 63/3. The favourites could only manage 241, setting Services 113 to win. 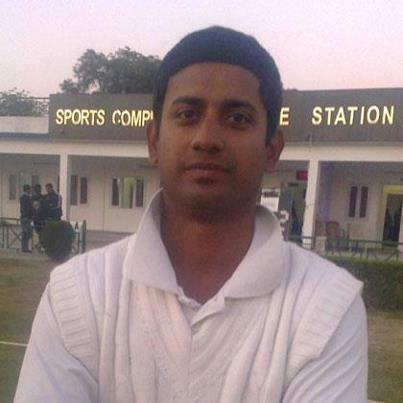 Yadav returned a heroic 7/71. If only chasing a small total was so easy. Ankit Rajpoot (10/97 in the match) made life difficult for Services in the modest chase, as he tore through the batting line-up to reduce Services to 54/5. Were they finally woken up from their dream? Was the fairy-tale over? Would Goliath, after all, win the duel? Enter skipper Soumik Chatterjee, a 24 year-old Indian Air Force sergeant. Chatterjee had injured his left knee while fielding in the deep in the first innings, and there were serious doubts of his further participation in the game. Yet, he had come in at No.11 in the first innings, and was duly out for a duck. In the second dig, he could not afford such a dismissal. The team needed someone to show spirit, and Chatterjee backed himself to go for glory, facing the challenge of batting on one good leg. And then the fairy-tale began again. With Paliwal at the other end, Chatterjee attacked the U.P bowlers like a warrior. Hard-hitting fours, straight sixes, and the occassional singles, hobbling on one leg. Paliwal himself played without inhibition, and the duo stitched a remarkable 59 run unbeaten stand to help Services get across the line. Paliwal scored an unbeaten 32, Chatterjee an unbeaten 34. Between them they logged 10 fours and 3 sixes. Fittingly, Chatterjee lofted Ali Murtaza over mid-on to bring up the win. Services scored 116/5 and the dream stayed on. Chatterjee, who was carried off by four of his team-mates from the dressing room to the team bus on Day One, had played one of the bravest knocks ever seen, leading his unheralded team to their proudest victory. ‘The match is my life’s biggest achievement,’ Chatterjee said after the win. What about the scans that revealed serious clotting around the knee? ‘There was no risk. Even if I lose my life, I will always be there for team,’ he replied emotionally, typifying the spirit of the defence forces. When Chatterjee came out to bat, the immediate reaction among journalists watching the game was that with his assumed inability to run, he would end up squeezing out any remaining momentum from the chase. But to everyone’s disbelief, he soon started limping and then, unable to bear the pain, hopping on his fit right leg for singles. ‘We are soldiers first, players later… A soldier remains a soldier, till he is no more.’ – these words from Wing Commander Deepak Bhaskar, the Services manager, summed up the attitude of his extraordinary team. Chatterjee averages a shade under 30 in his modest career so far, but no statistics will ever portray the limping captain who fought for his team against all odds. The game was lamentably played in front of near-empty stands, with little coverage and in the age of the make-believe ‘loyalties’ to cash-rich franchises, he showed what true loyalty means, in the gutsiest way possible. Not to mention the efforts of his team-mates – Nazar, Paliwal and Yadav in particular. Services face Mumbai next in a tough semifinal. Whether they win or lose that game, this is a story in the great game of cricket that deserves to be applauded and celebrated – a story of courage and ultimately coming up victorious in times of intense adversity.